Contact Mayor DeBlasio whether you live in New York or not — but especially if you live there — and complain about carriage horse abuse and practices and challenge him to at long last fulfill his election campaign promise to ban it. No more excuses, such as in 2015 when DeBlasio blamed the NY City Council for his failure. Sorry Mr. Mayor. No sale. Think about what you want to say and send the Mayor of New York City a letter, an online message or telephone his office to have your important say. 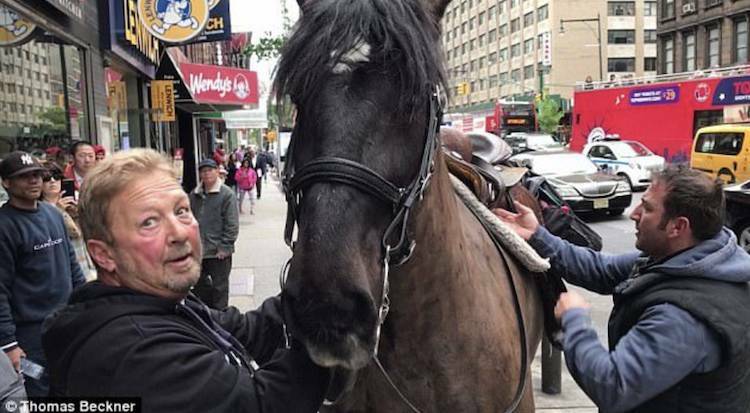 MANHATTAN, NYC — It is almost unbelievable the way yesterday’s runaway carriage horse incident is being reported. Not so much factually as spiritually. Here is what has been commonly reported. 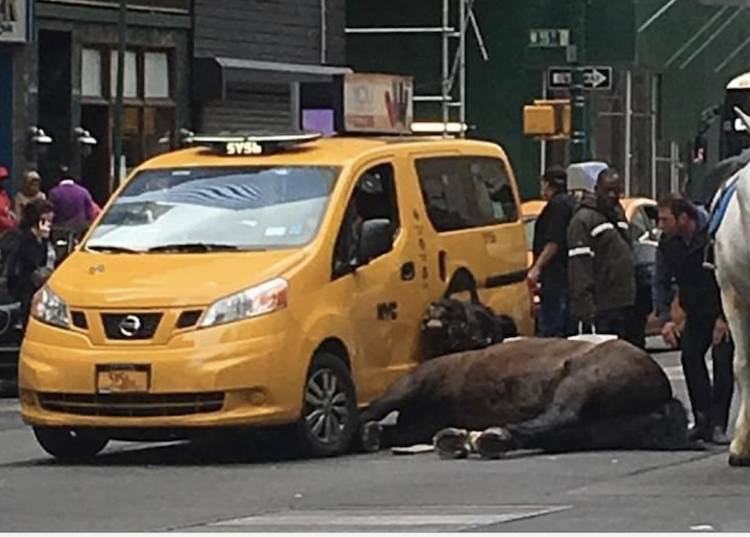 A carriage horse bolted on the streets of Midtown Monday morning galloping through several streets before slamming into a yellow cab. The horse’s head ended up against the taxi with one of his hooves jammed under the front left wheel. Unattributed image posted by The Daily Mail. The horse had not been pulling a carriage at the time he broke free and ran away. Witnesses believe he escaped from the place where he was being kept. The runaway horse was checked over at the scene of the accident and said to “look okay”. That was it. Checked over. Looked okay. Nothing about having a licensed veterinarian taking a look at the horse. I suppose with complaints now flowing in they will say they did that once they got him back to the garage, ahem … I mean, stable. Speaking of getting the horse back to where he was kept, how about this? They did not walk the runaway horse gently back to his multi story parking garage type stable. Nor did they call for a vehicle to transport him there as in other carriage horse accidents (the horse’s accommodation was assumed but not verified as being close by). They saddled him up to be ridden back to his claustrophobic digs. Perhaps this is what motivated our runaway horse to escape in the first place — to taste a just bit of momentary freedom. The above is a summation from what various news outlets are reporting in common on this story. There is nothing natural about the conditions carriage horses live and work in, particularly in cities like Manhattan. More often than not these conditions are mentally and physically cruel. What more do you need to know?